Neck and back pain after a car accident is a common experience for. Because of the sudden movements the body experienced in the crash, the spinal cord can sustain serious trauma resulting in a number of conditions that affect the upper, middle, lower back and the neck. According to the Illinois Department of Transportation, 2011 auto accident data reflected 84,172 injuries from car wrecks across the state. The injuries that result from these crashes can range from minor to severe and back and neck injuries can encompass a wide range of painful conditions for the victim. If you or someone you love experienced back and neck pain after an auto accident due to the negligence of another person, you may be entitled to compensation for the physical pain and mental anguish you suffered. The legal team at The Tapella & Eberspacher Law Firm can bring confidence and compassion to your auto accident case, and we will always fight for the MAXIMUM amount of compensation due to the victims of another’s negligent behaviors. Our lawyers work on a contingency fee basis, meaning that we only get paid when we win and we proudly offer 100%, no obligation case reviews. To find out how we can help, simply fill out the contact form located on this page or call any of our locations today at (855) 522-5291. The neck is made up of seven vertebrae known as the cervical spine. Though it is highly flexible, sudden or forceful movements can cause a strain or sprain of the muscles surrounding the cervical spine, resulting in conditions like whiplash. The middle, upper, and lower back can also be affected by the sudden, forceful movements of an auto accident, which manifest themselves as issues like herniated or slipped discs. 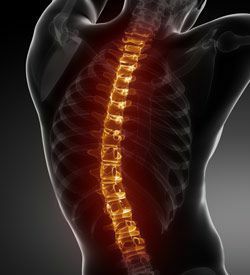 Acute spinal injury: These injuries occur at a specific site and cause serious pain for the victim. Acute injuries are usually followed by immediate swelling or bruising at the injury site. Examples include ruptured discs, spinal fracture or strains, and sprains. Ruptured discs: Spinal discs act as cushions between the vertebrae but these can easily be herniated or slipped during an auto accident because of the great amount of force and pressure exerted on the spine. Rupturing a disc will cause pain and discomfort in the back and neck, though it is possible to have ruptured a disc without any sign of injury. Spinal fracture or dislocation: Spinal fractures can show themselves in many forms: fractures, dislocations, or fracture-dislocations. When more pressure is exerted onto the bone than it can withstand, a fracture will occur; if the discs and ligaments that hold the spine in place become stretched, the spine can move out of alignment causing a dislocation; in some cases, both of these scenarios can occur, resulting in a fracture-dislocation. Neck strains or sprains: When the tendons and muscles of the back are injured, this is known as a strain. This can be caused by a ligament tear, usually from the twisting of a muscle or tendon. How Can a Lawyer Help My Back and Neck Pain after a Car Accident? An experienced car accident law firm can aggressively pursue your right to compensation because of the medical expenses, lost wages, and pain and anguish you experienced from your injuries. Working on a contingency fee basis allows our attorneys the opportunity to fight for their rights regardless of their ability to pay. The negligent party will be held responsible for their actions in a court of law when you decide to hire a law firm. In many cases, auto accident lawsuits take the negligent driver out from behind the wheel, where they may have hurt others in the future because of their recklessness. Car crashes can be tragic and frustrating events, and the law firm of Tapella and Eberspacher has years of experience fighting for the rights of their clients who have been hurt by the negligence others on the roads. We proudly serve clients from our offices which are located in Charleston, IL and St. Louis, MO.in addition to and most other surrounding towns and suburbs of these areas. To find out how we may be able to help you with your accident claim, contact us at 855-522-5291 for a no-fee, no-obligation, initial consultation. Our intake staff members will connect you with a lawyer best suited in handling your claim after a few initial questions about your accident. If you prefer to contact us online, simply fill out the ‘FREE CASE REVIEW’ form on this page and your claim will be reviewed right away.